Are you smart enough to dodge a telemarketer yet clueless as to how to chop a clove of garlic? Are you clever enough to know how to forward an email but don't know the difference between boiling and baking? Ingenious enough to operate nail clippers but not sure what a whisk is? 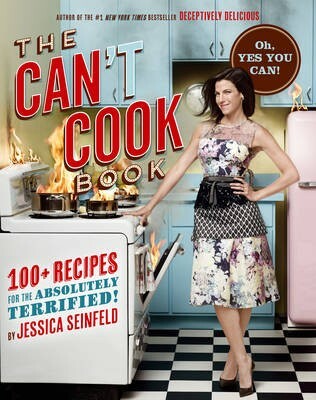 If you are basically competent, then Jessica Seinfeld's new book The Can't Cook Book is for you. If you find cooking scary or stressful or just boring, Jessica has a calm, confidence-building approach to cooking, even for those who've never read a recipe or used an oven. Jessica explains how to prepare deliciously simple food-from Caesar salad, rice pilaf, and roasted asparagus to lemon salmon, roast chicken, and pasta with clams. Each recipe explains upfront what the challenge will be and then shows exactly how to overcome any hurdles in easy-to-follow, step-by-step instructions. From stories about her grandmother and her seven-year-old son, to comparisons of a blender and a blowdryer (if you can work one, you can work the other! ), Jessica's amusing anecdotes put the nervous cook at ease. Elegantly designed and richly illustrated with gorgeous photographs and Microsoft tags linking to videos of Jessica cooking in her own home, The Can't Cook Book is perfect for anyone who wants to wean themselves off take-out meals and processed snacks and become empowered in the kitchen. The Can't Cook Book: Recipes for the Absolutely Terrified! The Can't Cook Book: 100 Recipes for the Absolutely Terrified!